Was walking back to office after lunch, walk through Orchard Central and saw that there are some stalls selling stuffs. Browsing around I came upon the stalls selling some hand made items. 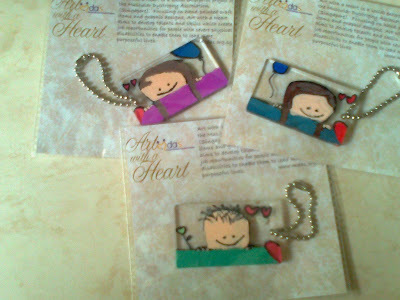 Its the Art with a Heart project by MDAS - Muscular Dystrophy Association (Singapore). They have key chains, fridge magnets, photo frames, some deco ideal for office and home etc. You can check out their market place. I bought these 3 key chains from them. Fell in love with the boy picture coz it reminds me of Little DinoEgg when he was young (he was a toddler with very little hair), took another 2 to be a xmas gift for sis n SIL. ooppsss... short of one for Simon haha~ coz these are the only boy/girl key chains left, will go back on Monday to see if there is another one to grab.